The Red Velvet Hookah lounge offers a place to relax after a hard day of sunning and volley ball on Pacific Beach. It is a relaxed environment that offers simply the basics in beverages and snacks. Chairs are comfortable and there is plenty of space to find a spot. The servicescape is simple with red velvet curtains and group arranged seating to spark conversation. Beverage offerings are related to tea, coffee, and sodas. Food is primarily snacks and cakes. 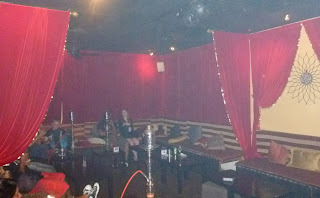 The biggest attraction is the large variety of Egyptian hookah flavors. Compared to other hookah lounges The Red Velvet has a significant offering. The atmosphere is relaxed and the patrons are relatively young. Located a few miles from Pacific Beach it provides a nice bridge between the beach and an evening out. It is also a great place to designate as a meeting place for friends who want to have conversations before heading their separate ways. The type of people who frequent the place are generally under that age of 25 and into the wild stages of their lives. The street of Garnet is busy and filled with clothing stores, bars, restaurants, surf shops, and many other businesses geared toward college students and locals. On the same block as Red Velvet is a coffee shop that offers another inviting place to sit and relax. Just strolling up and down the street will offer many different options and opportunities to find something interesting to do.